Burnout is all too common among physicians of all specialties, but those closest to the frontlines of care such as emergency medicine physicians, internists, and family physicians feel the effects head-on. According to Medscape, 50% of family physicians reported feeling burned out. But it’s not just veteran physicians suffering. Medical students and residents are also experiencing burnout – long before their medical careers begin. So what exactly causes burnout and what can be done to reverse this trend? Before we discuss prevention measures, we first need to explore what burnout is and how to recognize the signs either within yourself or your colleagues. Burnout is defined as loss of enthusiasm for work, feelings of cynicism, and a low sense of personal accomplishment. Burnout can have adverse effects on patient care, and many factors that lead to burnout are also associated with a higher likelihood of physicians leaving their practice. You constantly operate under high stress levels. You practice in a chaotic work environment. You don’t agree with your boss’ values or leadership. You’re the emotional buffer (no chance to vent or express feelings of stress). Your work-life balance is non-existent. Your work schedule provides no flexibility. 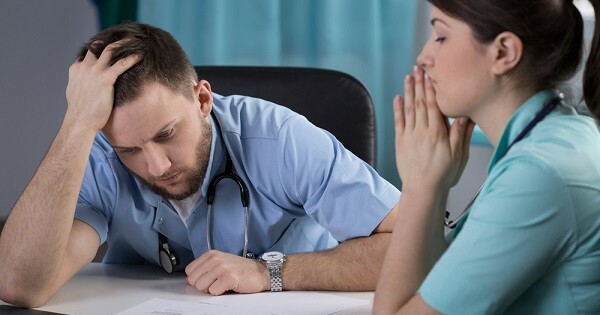 New research from the University of North Carolina, Chapel Hill revealed that medical resident burnout has reached epidemic levels. According to the survey, 70% of residents met the criteria for burnout. Interestingly enough, 50% of family medicine residents reported burnout, which was one the lowest rates of burnout in the survey. What’s more is that residents who felt their medical school training did not adequately prepare them for the demands of residency were more likely to experience burnout. Burnout happens gradually which means it can be prevented before it causes serious damage to physicians and their patients. So what can be done within the medical field to combat burnout? In the same Chapel Hill survey, residents were asked how burnout should be addressed. Survey respondents felt that more vacation time, increased support, and on-site childcare and exercise facilities would help alleviate burnout. Addressing a culture of dehumanization common in the educational environment and to suggest that medical educators model behaviors and attitudes to help prevent medical trainee burnout. Exploring avenues for conducting evidence-based investigations of medical school wellness programs, as well as potential partnerships with interested stakeholders to gauge these programs’ impact on student perceptions of primary care and their decisions to choose it as a specialty. Additional measures residents are taking to conquer burnout include: resiliency training, teaching trainees to prioritize self-care and effectively managing emotions through stress management resources. What can you do to lessen the effects of burnout and reignite your passion for practicing family medicine? Exercise, go out to dinner with friends, call up an old classmate or play video games – anything non-work related that can help alleviate stress and burn off steam can stop burnout before it starts. It also helps to try and find those hidden gems of why you decided to practice medicine in the first place. Whether it’s showcasing your years of expertise or the gratitude you receive from generations of families you’ve helped, find out where your passion began and hold on to it. The American Medical Association developed an interactive practice program to help address physician burnout. STEPS Forward addresses four key areas that could be affected by burnout: practice efficiency and patient care, patient health, physician health and technology and innovation. The American Academy of Family Physicians also has various resources to help young and veteran physicians fight burnout. For additional inspiration, read this article from Lynne Lillie, M.D. (member of the AAFP Board of Directors) in the AAFP Leader Voices Blog where she explains how the AAFP is winning burnout battles for you. Tell us: Have you experienced burnout? If so, what have you done to fight it? What resources or support systems did you use?